The nights are drawing in and winter is upon us once again. Here are a few tips and pointers to keep you safe through the winter. Winter tyres are not just for snow! Regular tyres are not designed for the cold weather conditions that are found in the UK in winter the rubber compound goes hard and does not flex to grip the road. Modern winter tyres are specifically designed to operate on roads which are below 7'C they have a softer compound of rubber with alllows the tyre to adhere to the road better than standard tyres which means better stopping capabilities. In snow and ice conditions these tyres come into their own and offer much safer handling. 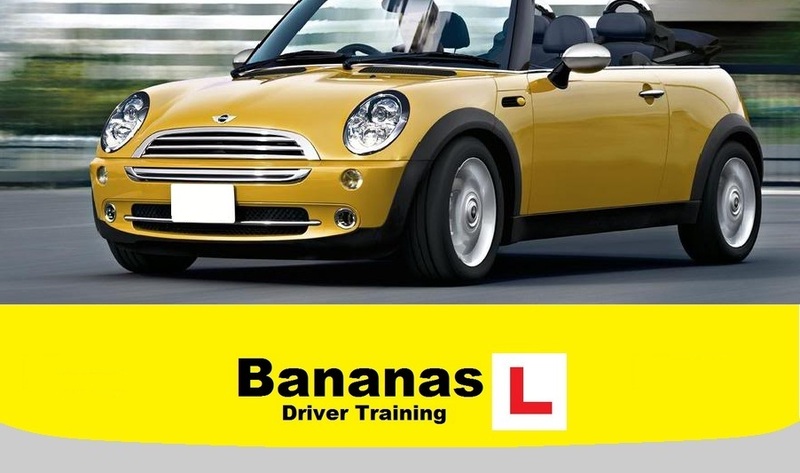 Most of Bananas instructors fit Winter Tyres to their training and private cars during the winter. Many of the tyre fitting companies offer a tyre hotel service if you don't want to store a set of tyres at home. We recommend carrying spare bulbs, Halfords sell handy bulb kits which are available for most types of car, driving with defective lights is dangerous as well as illegal. Light up! It is recommened to use dipped headlights in adverse weather conditions and when there is low sun. In many countries at this latitude it is mandatory to have day light running lights, many recent cars are fitted with daylight running lights. Remember not to use fog lights unless the visibility is severely reduced, if you can see the vehicles in front and behind then turn off your fog lights as you will be dazzling the other drivers. Keep your windows clean, your in car demister blows dirty air onto your windscreen, now is the time to give the inside of your windows a good clean. There is nothing more dangerous than driving into low winter sun when you cannot see clearly. Clear your windows and roof of ice and snow. Make sure you remove all snow and ice from the roof and all windows of your vehicle before driving. If you leave snow on the roof it can slide forward onto your windscreen when you brake or slide off onto the road causing a hazard to other road users. It is worth investing in a high visibility jacket should you find yourself stuck in the dark. It is important to ensure your car is mechanically maintained, regular servicing ensures that preventative measures are taken to reduce the likely hood of a break down. Remember to check your fluids and keep them topped up. Ensure you use a freeze resistant screen wash so you can keep your windows clear when it is cold. Ensure that your wiper blades clear water from the window effectively and resist the temptation to use your wipers to clear ice as that damages the rubber. Is your journey necessary, is the weather suitable and are you prepared? Remember to dress appropriately as you may get stuck or have a break down, a car offers little protection when the heaters are not working or if you have to stand at the side of a motorway in the rain, sleet or snow. Chocolate and something to drink. Remember if you scraped ice from your windows it is still on the roads, drive like you are on an ice rink! Firstly don't unless you really must! Plan ahead, check the weather and plan your journey. Allow plenty of time for your journey, let someone know where you are going and what time you are expected to arrive. Increase your following distance and be as smooth as possible with the controls. Brake early and gently to reduce the risk of skidding. Be gentle on gas to avoid wheel spinning. Slow down for bends and steer gently. Be aware that other road users often don't adjust their driving style to the conditions. Sitting behind the wheel wearing a T shirt with the heating on full blast listening to Raggae music it is easy to forget that it is icy outside the car!